What do US-China tensions mean for Asia? Frictions between China and the US go well beyond tariff disputes. There have been warnings from both the private and public sectors about the potential spillover effects of the ongoing trade war between the US and China. But frictions between the two sides go well beyond tariff disputes. The potential for trade tensions to expand into a political, as well as an economic, conflict is now looming. The question is, how a collision between the world’s two largest economies may impact the rest of the globe, and nowhere in the world are anxieties higher than in Asia. For most Asian nations, China is their single biggest trading destination, but the US remains an invaluable economic partner as well. As a result, the escalating tensions between the two economic giants have caused unease. Certainly, dire predictions from analysts and policymakers about how the US strategy to reduce its trade deficit with China could hurt global growth have only increased concerns. In October, the IMF cautioned that all countries would suffer as a result of the tensions and cut back its GDP projection for the US to 2.5% in 2019, and further still to 1.8% in 2020. This has undoubtedly cast a long shadow worldwide at a time when US growth has been critical to the global economy. Yet, with the Republicans maintaining their majority in the Senate at the US midterm elections, the Trump administration will have greater political incentive to keep pressure on Beijing with threats of raising tariffs beyond the $250 billion that has already been planned. That is to say, the political motivation over the next two years to project a strong America could well outweigh the economic incentive to seek a compromise or a solution that both sides could frame as a win. The upcoming 2020 US presidential election – the campaign for which will start to take shape soon – may make compromise even more difficult for either side of the political aisle. Importantly, Washington’s drive to push China into a corner is actually alienating, not just Beijing, but key US allies in Asia and beyond. Within this landscape, the goal for many Asian countries is to work selectively with Washington and Beijing, rather than siding with one side entirely over the other. Japan is one country that may look for a strategic balancing act. It remains a staunch ally of the US, especially as it continues to be dependent on the US security umbrella in a region where the risk of conflict looms large. For one, the ongoing territorial dispute over the Senkaku Islands with Beijing poses a risk of unintended conflict in the East China Sea. Then there is the prevailing risk of dealing with neighbouring North Korea, which has yet to show signs of denuclearization. Moreover, with Pyongyang’s rhetoric against Tokyo showing no signs of relenting, even as North Korea pushes forward with diplomatic engagement with other countries, Japan’s security future would seemingly be in the hands of the US. Nevertheless, there is a greater wariness in Japan and across Asia about the reliability of the US government as a strategic partner, and the likelihood for Washington to take Asia’s interests into consideration when making international policy decisions. That is no doubt the case when it comes to trade. While many countries may agree with Washington’s concerns about China’s unfair trade practices, the way the Trump administration has approached the issue has not garnered widespread support. What’s more, the fact that the US has, in the name of national security, imposed tariffs of 25% on steel and 10% on aluminum on most countries, including Japan and the European Union, has sparked disputes with long-standing US allies. The expectation may have been that countries traditionally close to the US would have been able to decouple rivalry over trade from broader political and diplomatic relations. That, however, may prove difficult if trade disputes escalate. Already, wariness is evident in public opinion. 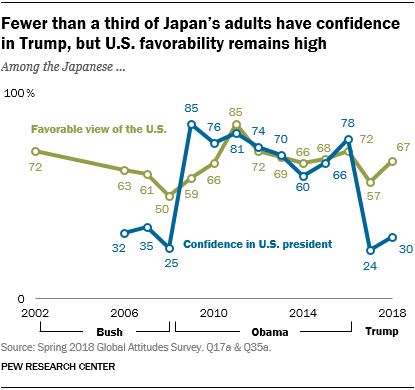 A Pew Research poll from October found that only 30% of adults in Japan have confidence in the Trump administration. Washington does have some support for its opposition to China’s unfair trade practices. In fact, in September, both Japan and the EU joined the US in voicing united opposition to “non-market oriented policies and practices of third countries”, most notably on industrial subsidies and protecting state-owned enterprises, as well as forced technology transfer. The US, EU, and Japan have also made clear the need for closer trilateral cooperation to facilitate digital trade whilst ensuring data security in the global digital economy. There are undoubtedly a number of issues the three sides can work closely together on that would strengthen the rule of law and free markets. At the same time, there is careful sensitivity by all three sides not to single out China, but rather to point out the government’s activities. Clearly, it is an awareness of the distortions Chinese trade practices create for the global economy on the one hand, while trying to maintain solid relations with the world’s second-largest economy on the other. It may, however, be increasingly difficult to maintain this balancing act, as the wedge between Washington and Beijing may widen further before they are willing to compromise. The fact that leaders at the November 2018 Asia-Pacific Economic Cooperation meeting in Papua New Guinea were unable to come up with a joint statement – the first failure of this kind in the entity’s 25-year history – even though the gathering was ostensibly an opportunity to promote economic cooperation, has raised concerns about a widening ideological divide between the US and China. This divide may force countries across Asia to take sides. Indeed, former US Treasury Secretary Henry Paulson warned that an “economic iron curtain” could fall upon the world, whereby the US and China would be in deadlock over strategic differences, and lead to a broader decline in capital as well as technological transfers worldwide. The growing regional fear is that, rather than decoupling the trade and economic issues from security concerns, alliances would be based on economic and security interests combined. For countries like Japan, in particular, balancing its economic interests with China, on the one hand, and its broader ties with the US may be an increasingly difficult act to accomplish without faltering.